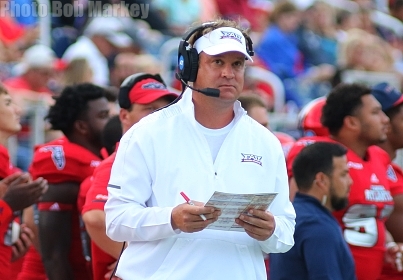 With the Marshall contest coming up, Florida Atlantic Head Coach Lane Kiffin offers his thoughts on the Thundering Herd, the Owls' bye week, getting help from FIU's win over MTSU, and the play of Harrison Bryant, amongst other topics. "As we learn our conference in our second year, these guys (Marshall) are arguably the most talented guys we see all year in conference. Nothing against anyone else, they just have a lot of really good looking players again. They return a lot of guys on defense. These guys last year held us, I would assume, to the least points and yards in the conference of any of our games and we have to go on the road to play them. We will have our hands full. They got their run game on track last week, running the ball over 300 yards in the game, so this is a big challenge for us." On the bye week for you especially going into playing such a strong opponent, how much was focusing on your own team and how much is it a head start for your next opponent? "We don't do a lot of things to get a head start on things just because we like to stay in our routine, so we just get a little bit. A lot more is on us and working on getting better. We actually got rained out one day, so we lost a day. So we really only had two practices. Probably more than anything, we got guys' legs back, we got guys healthy." It seemed like when we talked to the guys last week that maybe the confidence was up again. Are you maybe seeing more confidence and guys starting to get looser after the ODU win? "I don't know. It's still frustrating to look at all these numbers halfway through the year. There is a lot of really glaring defensive numbers that are beyond what I could have imagined, regardless of who we played. Not just yards and points, red zone, third downs … kind of everything. Then the turnovers on offense being interceptions. There is a lot of stuff to work on." The defensive bell is back. What prompted that and do you think that kind of stuff makes a difference? "I don't know. We just try anything to stop somebody. A couple weeks ago, I think it was going into the Middle Tennessee game, we had really struggled. We brought it back, 'going to answer the bell.' Going on the road, it was going to be a tough game. At times we did in that game on defense. We screwed that game up on offense obviously in the second quarter. I don't want to go back to that one. But, obviously that was a very frustrating game to give away against a quality team, but a team that we had a million chances to win (against)." Tyre Brady what about him makes him so dangerous in the passing game? "I think that they (Marshall) have bounced back with these quarterbacks, figuring out looks who to go with. We have been in that same kind of problem before. These guys are very talented. The receivers are really good and cause you some issues, just like a lot of teams in this conference. The two returning backs are tough to bring down and pretty special. That is a big issue upfront on defense, 6-6 and 6-7 inside. They return a ton of starters. This is a lot harder (of a) game than most people think it is." Marshall is a team that FAU has never beaten on the road. I know you haven't played them on the road and a lot of the players weren't either. What are you hearing about it and how do you focus the players to get ready for them? "We are kind of, after two years, used to those stats. No disrespect. A lot of these teams we haven't beat on the road. I don't think we had ever beaten Marshall, in the history of the school, before last year. Just another obstacle." The FIU win last week (over Middle Tennessee), you got a hand without even playing a game. Did you address that with the team, now that you have a better shot of accomplishing your goal? "We screwed up obviously, things got out of our control … (and) we needed some help. Obviously that was some help. Obviously they are a much different team when they lose their quarterback last year and this year. He is a great player and everything runs through their quarterback. When he is out of there, they are obviously very different like that game and the year before. We would need some more help but we've got a lot of work to do ourselves and they don't have a very difficult schedule. We are just focused on this week." At the end of the ODU game we saw Nick Weber at right guard. Was that because of an injury to (Antonio) Riles or was just to get Weber some snaps? "We wanted to get him in there. That just kind of fit with our theme last week of how we said we wanted to play more players, so guys' reps come down a little bit and Riles had been a little banged up. That was the plan before the game to execute." Harrison Bryant is a guy that can get overlooked with how many playmakers there are on that side of the ball. What kind of contributor do you see him being the second half (of the season)? "Hopefully it continues to go the way it went last week. He had a really good game and he always comes through. Our analytics, like we talked about, always showed at times (he's) our most productive guy, with catching range and yards after contact. We just keep try to find a way to get him the ball." With Frank Diaz joining the staff, I know you can't talk about recruits themselves, but what does Frank bring to FAU as a recruiter after getting experience under Chip Kelly and him being on Last Chance U and being recognizable? "Those guys can't recruit much (non-fulltime coaches) besides on campus when recruits come to visit. So it doesn't impact a whole lot that way." With Willie Wright, it seems like he hasn't been as explosive early this year as he was last year. Is that something where defenses are keying on him more because they know he can do it and is getting him the ball a little further downfield as opposed to the little tosses behind the line of scrimmage going to be more of a focus going forward? "We have missed some. There was one early in the game we should have scored a touchdown on and we missed the throw to him, a deep one down the middle. We gotta make the plays when they are there to make. We had another one in the UCF game where he got behind them and we got sacked. Numbers sometimes can be misleading both ways. I'm sure he will end up with a lot better numbers than in the last couple of weeks." Midway through the season, how have De'Andre Johnson and Rafe Peavey taken Chris Robison, a younger quarterback, starting over them and how have you approached them being backups? "I think that is a difficult situation. Anytime that you are in it, especially when you are older, and both guys have played before, everybody wants to be the starter. It is always tough at every spot, but quarterbacks always think that they should be the starter. Every quarterbacks' dad thinks that they should be the starter. That has always been the case everywhere you're at. It is nothing new, but they have handled the situation very well." Noah Jefferson (newcomer on the defensive line) got into the game last week. How much can he grow into this defense? "It would be good if he could pick the stuff up, (but) it's hard. He got here after the season already started. That is tough obviously. We need help. That is a position we lack height in. We have some good players, but they are a little shorter. It would be good if he could help us out."